Hello all, it's been a long time since I've logged in. Just wanted to share some updates with you over the last year or so. I converted my 10G acrylic showcase tank to an aquaponics setup. The 10G acrylic had been in the part of our house I dub "kitty country", and mostly out of boredom our black longhair learned how to go fishing. 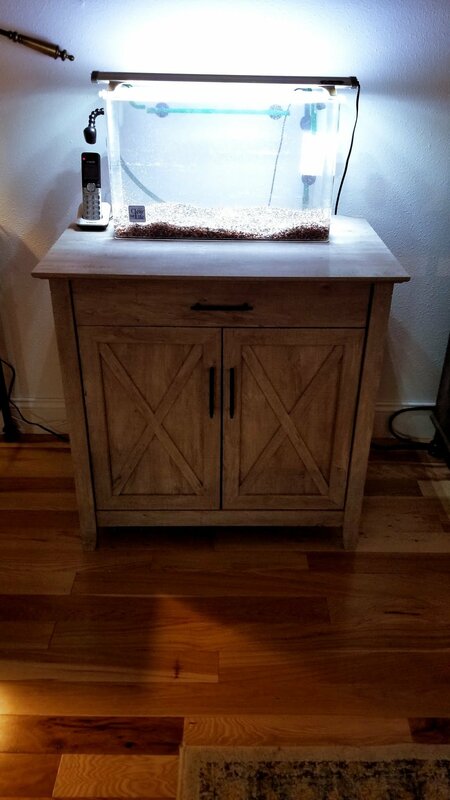 The school of 8 heteromorpha rasborae became a duo over time, and I decided in addition to moving the tank out of kitty country I wanted to try my hand at aquaponics. I bought a conversion kit and I am happy to say that I have four basil plants which are doing great. 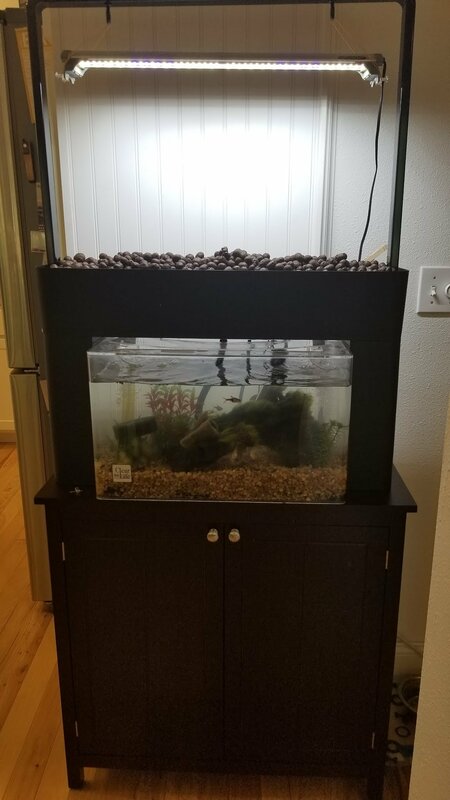 Over time, I learned that the aquaponics setup was not suited to an acrylic tank with a top brace, as evidenced by several flooding/overflowing incidents. Thus, I went to the store and bought a standard 10G tank and mothballed the 10G acrylic. My aquaponics setup is a very low-tech tank consisting of plastic decor and a 10lb chunk of Mopani, an under-gravel filter, 8 heteromorpha rasboras, red cherry shrimp, and red ramshorn snails. The tank itself is unlit. However, supported above the tank is a hydroponic bed which has clay media and the aforementioned hydroponic basil plants nestled in it. There is a submersible pump in the middle of the tank which is on a timer and two return spouts. Every hour for 15 minutes the pump turns on and fills the hydroponic bed with tank water, which then drains back into the tank thru standpipes. There is a bracket above the hydroponic bed which hosts a fluorescent fixture, also on a timer, which shines primarily on the plants but some indirect light shines into the tank below. Being an avid aquarist, I cannot abide a mothballed tank. 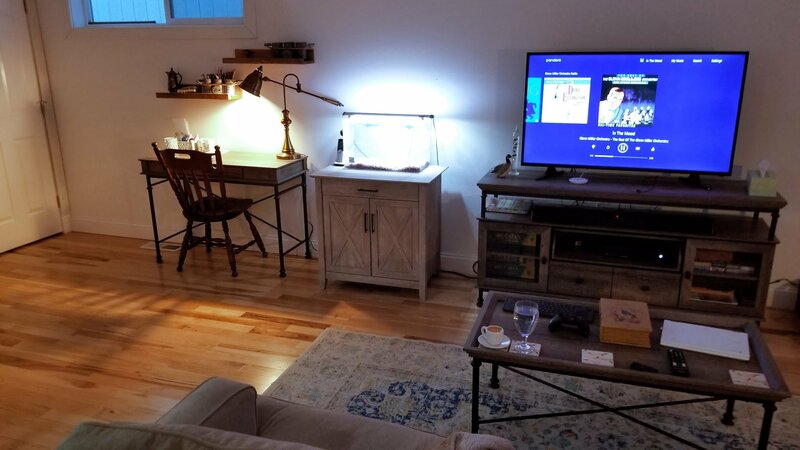 My wife and I donated a piano and freed up a large section of our living room, which immediately became the site of a new showcase tank. 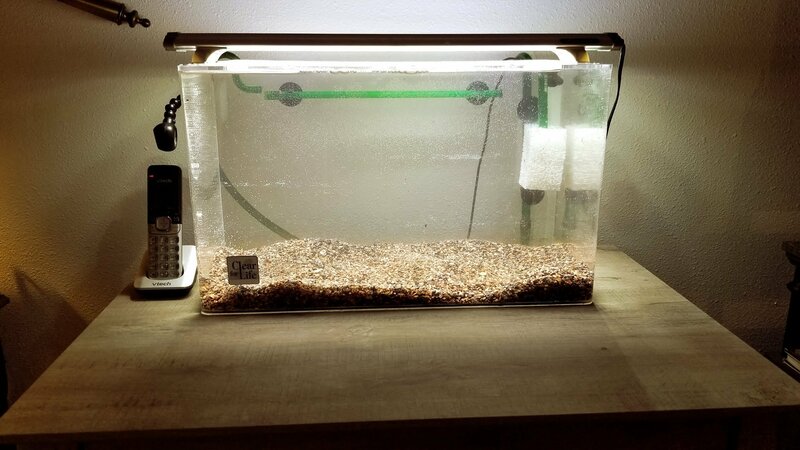 The tank is a Clear-For-Life 10G acrylic, which has an Eheim 2011 canister filter, Hydor ETH 200W in-line heater, and a InkBird heater controller. I use a heater controller because, after reading reviews, I learned the Hydor heaters are prone to failing ON and cooking everything in the tank. I wanted an in-line heater coupled with the canister filter to minimize the hardware visible in the tank. On top is a Finnex Planted+ 17W LED fixture on a timer. The tank has a chunk of driftwood, several varieties of plants, 6 neon tetras, 2 nerite snails, and 3 Amano shrimp as of today. I plan to add a German Blue Ram to complete the tank. Pictures are attached, current photos will be taken this weekend.